ST. GEORGE – From members of Congress to county commissioners, several elected officials gathered at the State Capital Monday to present a united opposition to the potential creation of the Bears Ears National Monument in southeast Utah. Led by Sen. Mike Lee, R-Utah, the group, numbering 15 elected officials, each asked outgoing President Barack Obama during a press conference not to use the Antiquities Act to “unilaterally” create a “midnight monument.” While they stood in agreement that the Bears Ears region would benefit from additional protection, they argued it should be done through Congress and involve more state and local public input and control. Sen. Orrin Hatch, R-Utah, said the decision to create the monument – something he said he believes the president will do – will be “one of the most egregious abuses of federal and executive power” he’s ever seen. 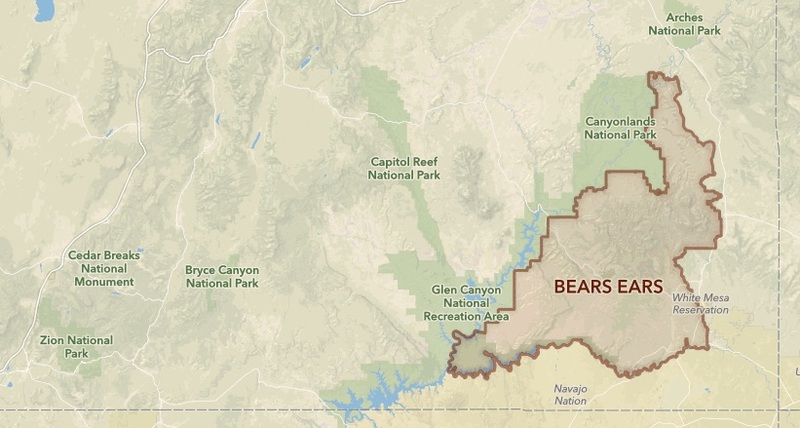 The Bears Ears National Monument would cover 1.9 million acres in San Juan County. Within that nearly 2 million acres is 150,000 acres of state land overseen by the School and Institutional Trust Lands Administration, more commonly known as SITLA. These lands are sold to various parties with funds going to public education in the state. Both Hatch and state Sen. David Hinkins, R-Orangeville, who represents San Juan County, said locking up those lands in a national monument would do more harm than good. Those lands will be “rendered useless,” Hatch said. He also said a monument would suffocate economic development and activity in the region as well. If the designation goes through, Utah Attorney General Sean Reyes said his office is preparing a lawsuit seeking to undo it. “I feel strongly that what’s happening is wrong,” said state Rep. Mike Noel, R-Kanab, who also represents San Juan County. “There are more than enough laws and ordinances in place” to protect the region, he said, adding that the Bureau of Land Management and U.S. Forest Service already oversee part of the region. Noel, who recently submitted his name to the incoming Trump administration for consideration as the next director for the BLM, said he could see the fight over the monument going to the Supreme Court. The San Juan County Commission was also present at the press conference with members expressing their continuing opposition as well. “My constituents do not want another national monument,” Commissioner Rebecca Benally said. Benally, who is Navajo, said President Obama would not be designating the monument for the local people, but for groups that are using the Navajo to further their own agenda. The Bears Ears region is sacred to Native Americans, Benally said. It is a place where they gather medicines, herbs, firewood and hunt, and a national monument could take that away, she said. 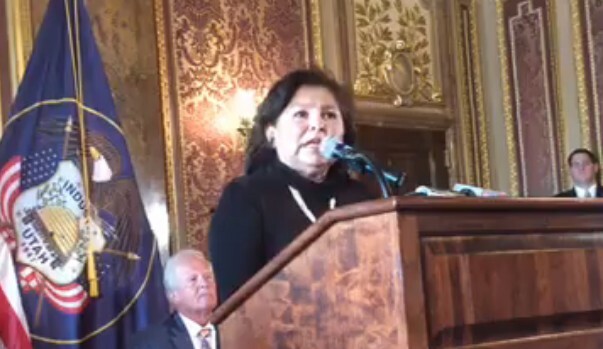 According to The Salt Lake Tribune, some elected representatives of the Navajo and Zuni nations, crashed Monday’s event at the Capitol. Filfred and others support the proposal by the Bears Ears Inter-Tribal Coalition to create the monument. As put forth in the proposal, the Native Americans would have a hand in managing the national monument while also maintaining access to the land for the purposes Benally argues will be lost to them. Still, the process should go through Congress and not the president’s office, those opposed to the monument said. Gov. Gary Herbert asked the president to consider Rep. Rob Bishop’s Public Lands Initiative legislation in relation to Bears Ears. The proposed legislation identifies lands for conservation and wilderness status while leaving others open for use. This would apply to Bears Ears as well. While the Public Lands Initiative passed out of the House Natural Resources Committee, which Bishop chairs, it did not get a vote in Congress before it adjourned for the year. Jennifer Rokala, of the Center for Western Priorities, told the The Salt Lake Tribune that Utah’s congressional delegation has wasted its chances at protecting Bears Ears through the legislative process. Interior Secretary Sally Jewel visited the Bears Ears region in July in order to see it for herself and hear from both supporters and detractors of a national monument designation. 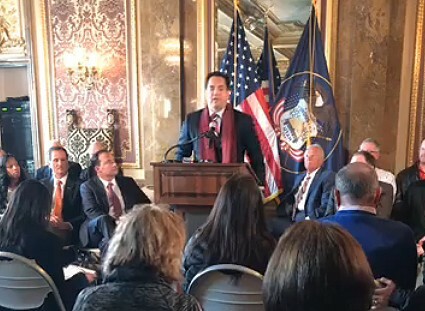 Should the designation take place, Lee said he and other members of Utah’s congressional delegation would do everything they could to undo the designation. Part of that could involve introducing legislation to curtail the use of the Antiquities Act by future presidents, he said. “Mr. President, we beg of you, don’t do this,” Lee said. There’s only 3 things these mormon politicians are after with this agenda: mining, oil, and gas. Greed is it. Anything else they blather on about is just lies and bs. It’s their lying that bothers me. If it’s oil and gas their after then just say it. Might be fun to see their totals in kickbacks from the industry also $$$. lies lies lies, it’s all they know. This is absolutely fantastic news and I’m sure this will result in a positive reaction from the community and I would like to thank all those involved in making this possible. we are so blessed to have these wonderful political group representing the Great state of Utah. Praise the Lord ! Correction. Rep. Mike Noel, R-Kanab, does not represent San Juan County as the story indicates. He represents Kane County and is a principal backer for the Utah Legislature land grab of federal lands. In addition, the designation of a national monument does not deprive Native Americans of any of the uses they have traditionally had with public lands. To imply otherwise as some have suggested is false. Hi Karen, I just have one clarification point to make to your comment, that concerning Rep. Mike Noel’s district. The rest I leave to the ongoing conversation on the subject of the monument.